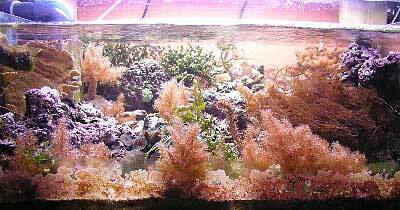 I have kept freshwater tanks since I was about 10 years old. 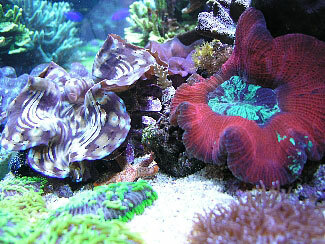 My first reef tank was set up in 1993. 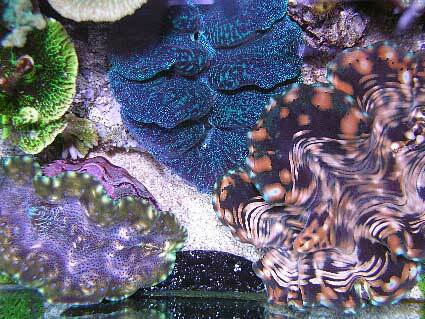 It was a small 36 gallon reef tank, which was built almost completely by a "Do It Yourself" method. I made the tank, protein skimmer, light canopy, fluorescent light wiring, top-off doser and calcium reactor. Although it was alot of hard work, the result was very satisfying. My second reef was an 85 gallon tank with a sump, DIY skimmer, Jaubert-style substrate with plenum, and eight 36 watt normal output fluorescent tubes for lighting. This tank was very successful. During the three years it was in operation, I was able to observe several spawning events; one large Acropora spawned twice, one Fungia several times, and two Tridacna croceas also spawned several times. Over the course of time, the fluorescent tubes were replaced with metal halide lighting and the Jaubert style plenum was removed. My current tank was set up in April of 2002. 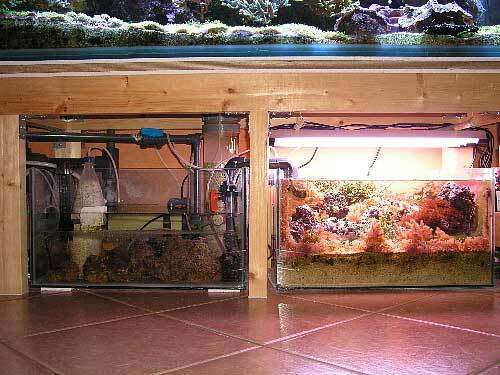 Being a reef aquarium enthusiast demands a lot of patience and devotion, especially here in Finland. It seems that here we are in a constant shortage of livestock. This is due, at least in part, to the fact that our country is situated in the northern hemisphere quite some distance away from the main air traffic lines. This makes the animals quite expensive. Also, the number of reefkeepers in our country is quite low, so the demand for reef aquarium equipment and livestock is quite low, and consequently the number of dealers is also limited. The main tank is a 110 gallon all glass aquarium. Under the tank there is a 19 gallon sump and a 19 gallon refugium. In the main tank, there is a one to four inch sand bed consisting mainly of coral sand with particles of 0.04 to 0.08 inch diameter. 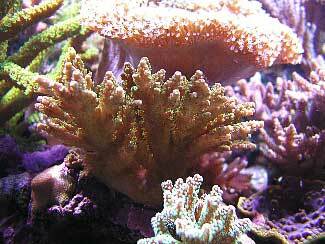 The refugium contains four inches of coral sand of the same quality. Roughly 220 lbs. 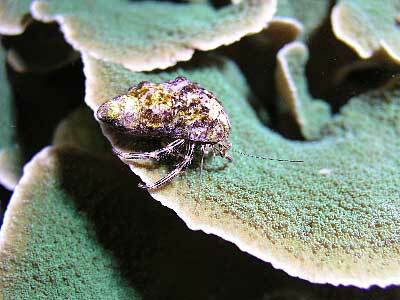 of live rock from Indonesia is used in the system, most of which is in the main tank, but a little is also in the sump and the refugium. The water comes from the overflow of the tank by gravity flow into the skimmer, and from there the water flows to the sump. 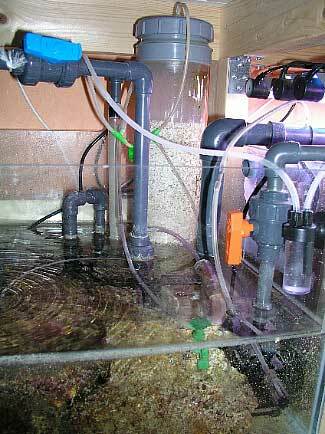 An Aquabee 2000/1 pump returns the water to the main tank. From the sump the Aquabee 1000 pumps water to the refugium, and the water overflows back into the sump near the main return pump. In the main tank most of the water circulation is provided by Tunze 7210/2 and 7410/2 powerheads. 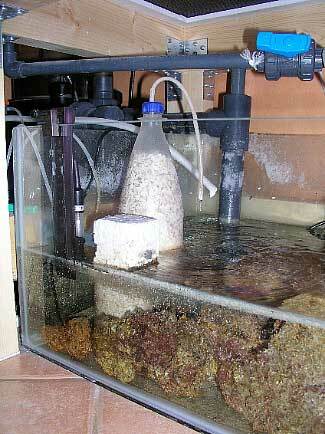 Both an Aquabee 2000 and an Aquabee 1000 are used to pump water behind the live rock. The flow rate through the pumps on the main tank is about 2300 gallons per hour. A close up of the refugium. The lighting of the main tank consists of a Giesemann "System 230 Plus" with two Aqua Connect Performance 14000K 250 watt double-ended metal halide bulbs, which are on for 10 hours a day. Additional lighting comes from 2 x 24 watt Osram 67 blue power compact bulbs, on for 14 hours a day. Prior to installing the 14000K bulbs, I used Ushio 10000K bulbs, but the light was a bit too yellow for my taste. The 14000K bulbs seem quite blue, and I suspect the PAR reading is not as high as the Ushios. Therefore, I think that in the future I will go back to the Ushios and use more supplemental blue and actinic light. 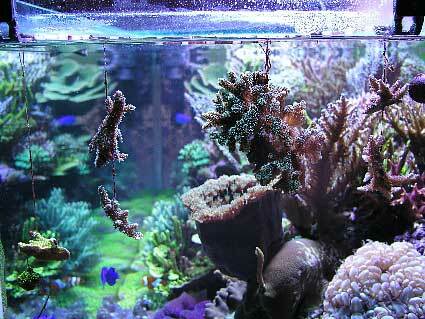 With respect to the growth rate of the corals, I haven't noticed any difference between these metal halide bulbs. The lighting of the refugium is provided by four 18 watt normal output fluorescent bulbs, two 10000K, one 6500K and one blue bulb. The lights in the refugium are on for 16 hours at night on a reverse daylight schedule. The protein skimmer is an Aqua Medic Turboflotor 5000 Shorty Compact. It's an excellent needle-wheel skimmer, and I'm very pleased with it. Although its' foam production is quite minimal at present, this is highly dependent on the feeding schedule for the fish and corals. 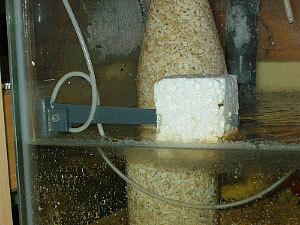 The water level in the sump is maintained by a very simple and reliable DIY mechanical float switch. Kalkwasser is used for all top-off water. Reverse osmosis water runs through a Deltec KM500 kalkwasser reactor and into the sump as a constant slow flow of drops. The evaporation rate of the system is about one gallon per day. The calcium reactor is a DIY two-stage reactor with adjustable CO2 recirculation. The first calcium reactor I made was from a Pepsi bottle; this new one is a bit more elegant, but it also has a Pepsi bottle as a second reactor chamber. The design is very simple but effective. 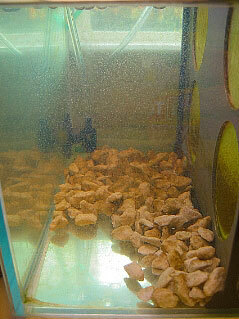 The glass of the main tank is cleaned twice a week. A six-gallon water change is done every week. The salt is mixed with RO water using Instant Ocean and Tropic Marin salts, aerated for about one hour and then added to the tank. The skimmer cup is cleaned about once a week. Strontium and iron are added once a week and iodine is added daily as Lugol's solution. Some time ago I didn't use any of the previously mentioned additives. 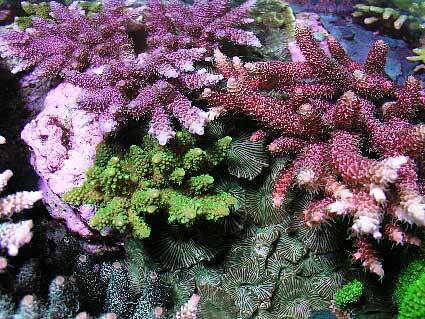 I then had tissue sloughing in many of my Acropora colonies. Upon checking the water parameters in the tank, everything seemed fine, but the Sr and I2 were both zero according to the Salifert test kits. I quickly raised these values to normal seawater levels and the the sloughing stopped. Of course, I don't know if Sr and I2 had any significant role in stopping the problem, but since that event occurred, I have added them to keep their levels within the range of normal seawater. 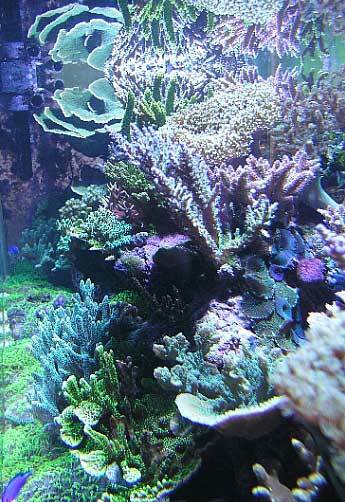 I also add Salifert Amino Coral weekly. The Caulerpa racemosa is thinned about twice a month from the refugium. 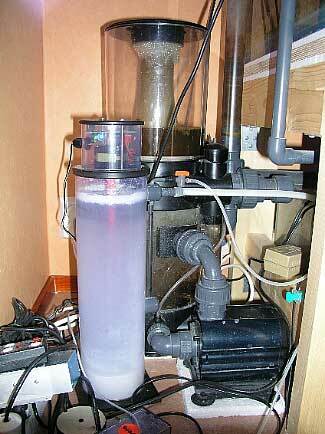 At present I'm using nine ounces of Sera activated carbon run continuously in the sump. The carbon is replaced once a month. I'm also testing the passive use of Rowaphos to determine if there are any beneficial effects to my reef. The tank is fed once a day. In my opinion, the food amount given is not very high. I use mainly frozen brine shrimp, Mysis and krill. 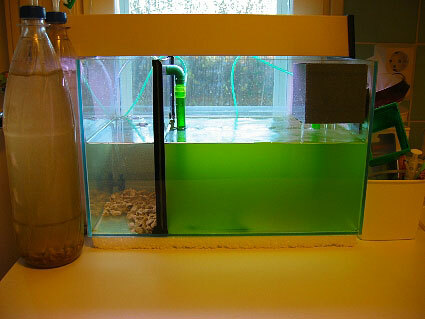 Live phytoplankton is given every day; live brine shrimp and live rotifers are offered a couple of times per week. Occasionally, the food is first soaked in GroTech VitAmino vitamin and aminoacid solution for hour or two before usage. 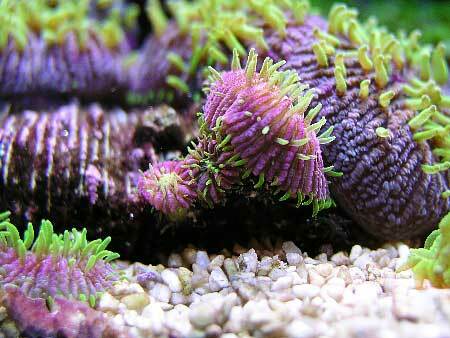 Every other night H&S Marine de Luxe or AB Aqualine plancto coral food is given. The plankton reactor. Right: A close up of the zooplankton compartment. In this reactor both phytoplankton and zooplankton can be cultured. The small light spots in the water are rotifers, Brachionus plicatilis. Phytoplankton and rotifers are cultured in a Zinn planktonreactor. It is an excellent product to cultivate phyto- and zooplankton (Nannochloropsis sp. & Brachionus plicatilis) with a minimal amount of work. Once you set it up, it can function for up to a month or two with very little maintenance. It has worked for me for up to two months without any crash of the system. I now clean the reactor once a month and start the cultures again. I will never go back to the bottles again. 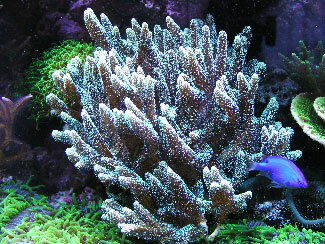 The tank is mainly dominated by SPS corals including Acropora, Montipora and Pocillopora species, but there are also a couple of soft corals. Many of the corals are grown from fragments from my previous tank, but I received many fragments from my fellow aquarists, Tatu Vaajalahti and Aleksandr Pyndyk from Tampere, Finland. 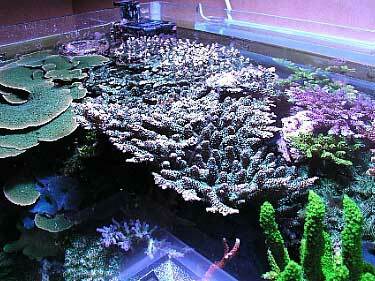 A significant part of the tank is dominated by a large Acropora colony, which I originally obtained in 1995. Its original size was about 7 x 7 x 7 cm. Within two years it had grown to the size of 35 x 35 x 20 cm. In the late summer of 1997 (and also in 1998) I saw it releasing small 1mm egg-sperm bundles. The first spawning was mentioned by Alf Jacob Nilsen in Aquarium Frontiers and also in The Modern Coral Reef Aquarium, Volume 2 and Volume 3. 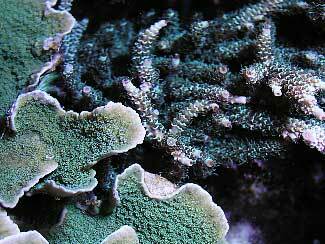 It was first believed to be Acropora latistella, but my friend suggested that it is more likely Acropora prostrata. Since the spawning this coral has been fragmented several times. Tens of fragments have been sold and given away, and even more have been thrown away. Every two years I have been forced to break down the whole colony because it has grown to the top of the aquarium and shades the other corals. 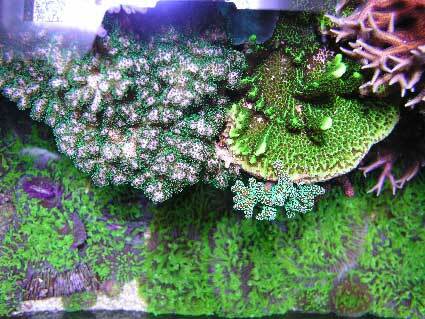 It is the fastest growing stony coral I have ever owned. 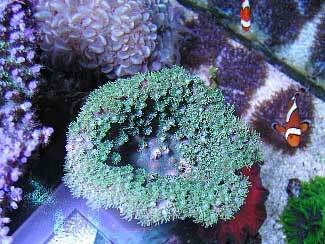 Another interesting coral in my tank is a Fungia which I also obtained in 1995. It is a male since it has released sperm couple of times during 1997-1998. 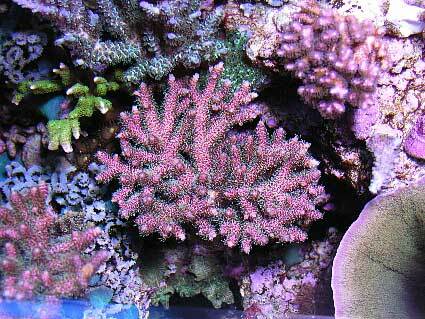 In 1999, it was shaded by the above mentioned large Acropora for several months. During that period part of the coral died. 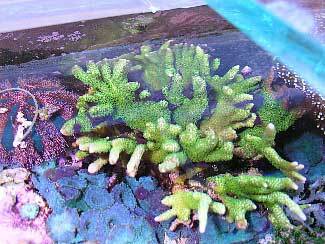 After fragmentation of the Acropora, the Fungia was better illuminated and it began to recover and produced small anthocauli. 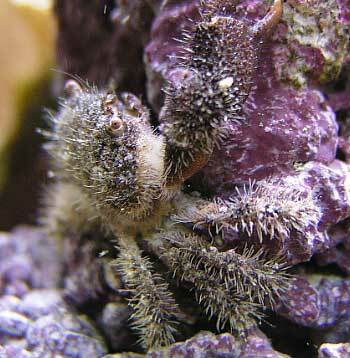 Each anthocaulus detaches itself from the stalk and then a new anthocaulus is produced. Over the course of three years tens of new daughter polyps have been born, and this continues to this day. Polyphyllia talpina, fragmented from a large individual with an axe.